It's been awhile since I write about traveling but I guess it's time to continue with my South Korea trip! I'm really excited to write about this topic because it is my first time driving left-handed in another country. So, without further ado let's start the engine! I have been driving in my hometown (Malaysia) for almost three years now. I wouldn't say I'm an experienced driver but I do pretty great on the road. But, knowing that you will be driving the opposite side of normal driver seat can be a little bit nerve wrecking. Before I explained even further about the self-driving thingy, if you already set your mind to drive at overseas make sure to click How Obtained International Driving Permit (IDP) For Malaysians to ease your process! So, let's begin with 4 tips that I can share with you through my experience, do read it thoroughly because all the info here are important especially if you're first-timer and not sure yet whether you will be driving or not. My focus and confidence expression. Only god knows how nervous I am inside. Let me tell you something. Driving is not my first choice in Jeju, and I was hoping they will have a subway or train station there, but you know sometimes in life you can't get all of it. Then, I was considering hiring a tour guide but looking at budget wise and discussion, we decided to drive at the end. Again, I'm really freaked out after that because of the left-handed driver seat. Plus, it was my first time so I didn't know all the rules and situation at Jeju. So, the best advice I can give is if your guts aren't that positive, you better canceled your intention. Imagined you will be driving around without any focus and confidence inside yourself, it won't be that good. So, as a first-time driver, I think it's crucial to know what you are going to do. 2. Rent a car at Lotte or others . . .
Another important thing after you are confirmed to drive is to proceed with renting a car. It is best to book a month or as early as you can, especially if you are planning to visit Jeju during peak season: Autumn (March - June). Back to the roots, I booked a car at Lotte-Rent-A-Car after survey other platforms related. The strong reason that makes me booking with Lotte because of DKYW 2017 coupon and tons of positive review. I want to book a car on 22/8/17 - 24/8/17 using DKYW 2017 Coupon. Do let me know how much and what I should do once I arrived there! She replied: Total rental charge KRW 121,100 has been discounted 58% as DKYW 2017 Coupon (1) Rental Charge + (2) CDW (Zero Excess) + (3) GPS in English included. To get the discount, please present this coupon at rental counter. Long story short, we take a bus from Jeju Airport to the bus station and Lotte (they provided it for free). I would say the process runs smoothly and the best part is we didn't have to key in phone number for GPS. 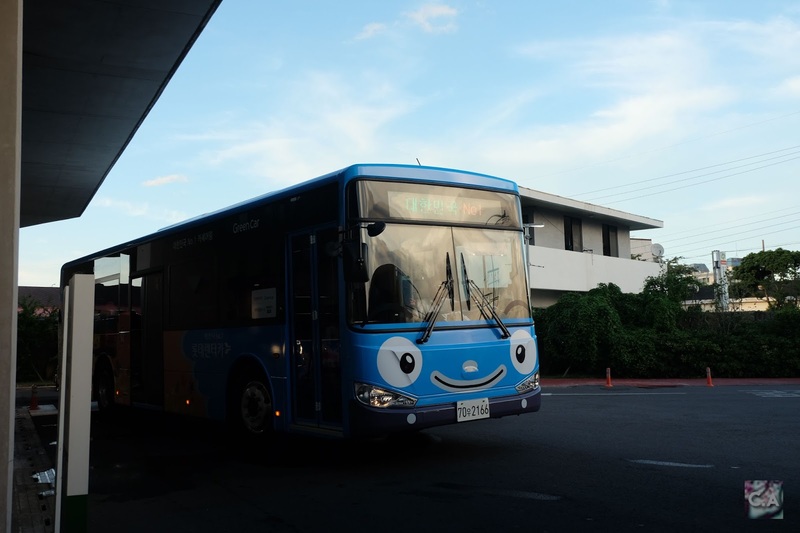 Free bus to Lotte-Rent-Car: Tayo! We spend around KRW 36,000 for 3 days 2 night (23.077 litre) and got a refund of RM25 (still money though 😂 ) for sending the car early. It looks complicated but it won't if you have already prepared all the documents needed. 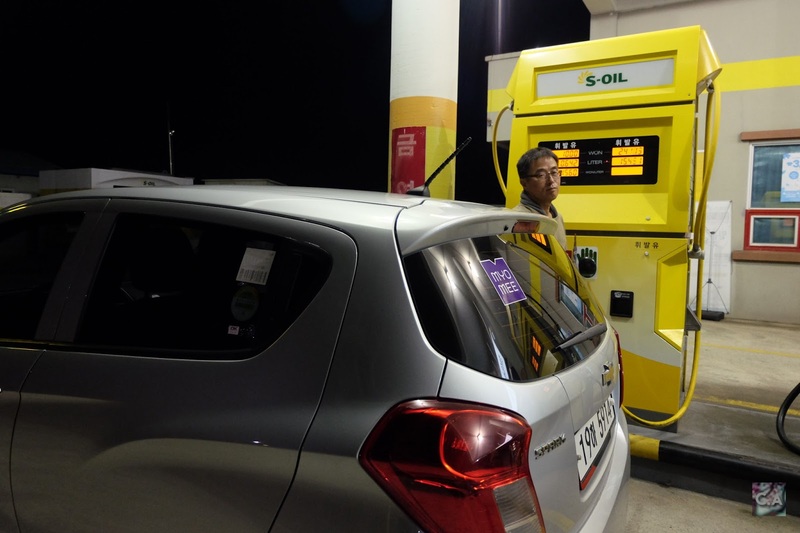 For Malaysian, I suggest you to rent a car with Kereta Sewa Jeju, because you can pay in Ringgit Malaysia! 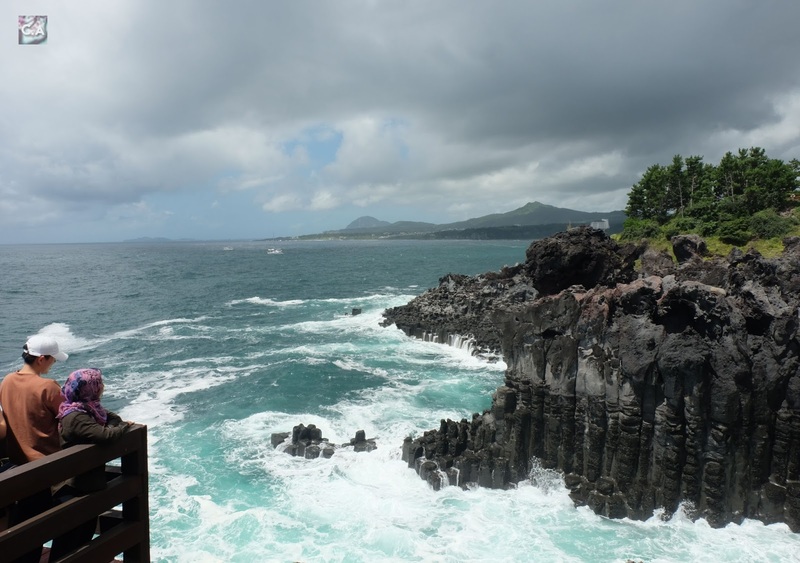 For Jeju, I followed my itinerary exactly 100%, not the flow but the places that I listed. So, here's the thing: from Lotte-Rent-A-Car I went to Seogwipo to check in at the guest house. When I arrived it was already middle of the night, which I prepared for. But, what I'm not prepared was the long hour of raining. It was nerve wrecking and I'm being super duper careful. The journey took around 1-2 hours (like driving to Cameron Highland: winding road) but Alhamdulillah we arrived safely. On the next morning, we visit to 3 places and 4-5 places on the second day. Imagined if I depends on public transport for 3 days 2 nights I won't get to any of this places. After done roaming around at the Seogwipo area, we transfer to our hotel at the city which near to the airport, then Yongduam Dragon Rock and last before sending back the car we grab a dinner. So far, everything run smoothly but from my personal experiences I suggest you to at least spend 3 - 4 days. 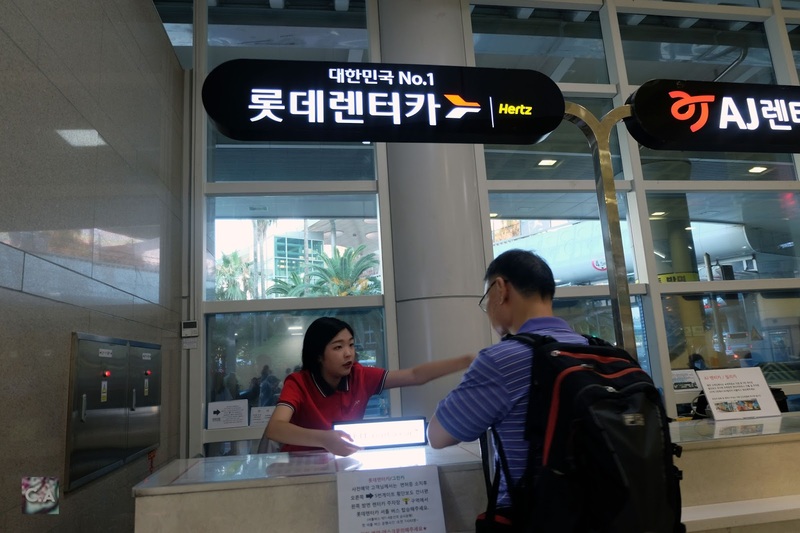 If you insist of taking public transport you might need to take longer than that, but there are another options: taxi or book your package on Jeju Muslim Travel. 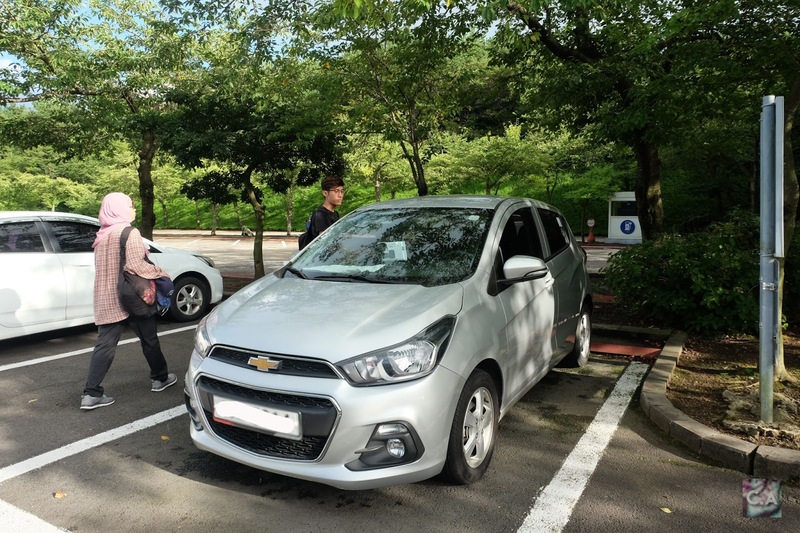 Our 3 days 2 night car: Chevrolet Spark. The last and most important things for you to remember is the traffic rules. I may look like I ready to conquered Jeju in no time but I do make some big mistakes. Here's the drill, when you drive on left hand side everything is changing. You will enter a roundabout on the left side, faster lane will switch to left so if you wanted to drive slow, stick to the right side. Roundabout. Well I almost hit an old man and I'm not proud of it. Please make sure to stop when you're going to enter road after roundabout. I didn't notice traffic light at each of side of roundabout and that's when I get distract. 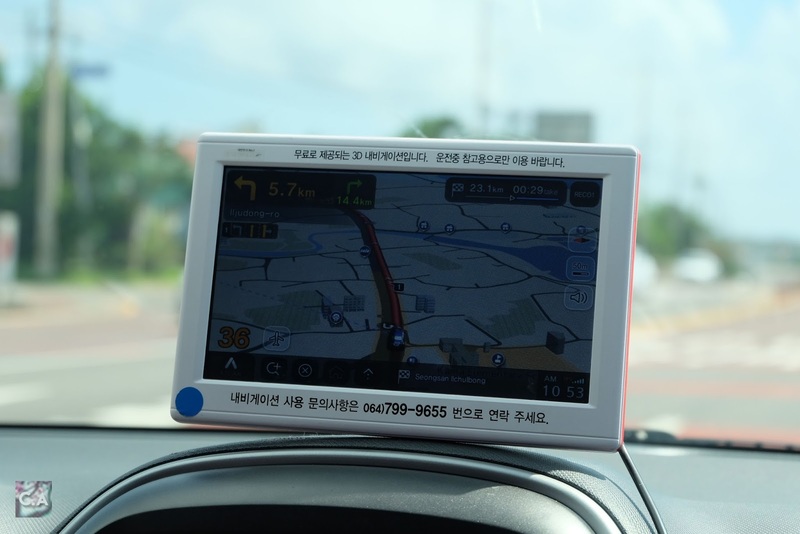 Another driving tips: South Korea's cars keep to the right side of the road. Drivers need to check the left side first, then the right side at an intersection. Speed limit in Jeju is 70 km/h at most of the road, but when you enter village area it will be 50km/h. So, be patient don't drive like it was your own road. Do follow the speed limit no matter what. I was glad that my GPS is giving me a reminder if I passed my speed limit. I take my time to write this post in making sure that I won't missed out a thing. My intention are to help and guide you through my experiences which I hope I'm succeed. Through this post, it will be a self reminder for me too if I decided to drive again at Jeju. I really hope that this post will help you in some ways, it would be more awesome if you share your experiences in the comment section below. Keep it coming because we can help others through our writing and experiences. If you want to know more about self-drive in Jeju, make sure to click here. Til then, I will see you on my next Jeju trip post! Sneak peak to upcoming Korea trip blogpost! Who can guess where is this place? Hi Aqalili! I was looking for this and came up to ur page. May I know, when you register in Lotte rental car website, u register as member or guest? I've actually emailed them because I want to use discount from Discover Korea Your Way Book. Hope this will help you! Very useful info! Thank you. I will self drive @ Jeju next year. Don't be nervous. Just rilex je and confidence and have fun! Thank you so much for sharing your driving experienced at Jeju. Good read! How did you find driving at night? I might have to drive from the airport to my hotel in Seogwipo on arrival and feeling nervous. it's so nice of you to have posted these tips! kinda worried for myself since i intend to drive in jeju too. is it scary driving on the right side of the road? My pleasure! 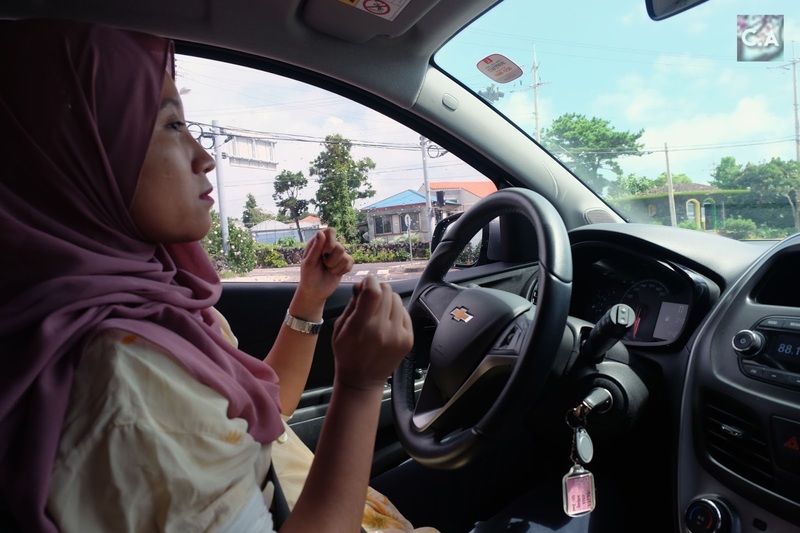 Love to share my experiences in this blog 😃 At first it was nervous + scary because I drive at night, it was raining and my first time drive left handed. But, over time I kind of get used to it. When are u planning to went there? assalamualaikum..nak tanya dia punya brek dengan minyak still sama macam sini kan? maksud saya minyak kaki sebelah kanan..break kaki sebelah kiri kan? Hi, you passed a hard driving test in Jeju as a foreigner. it's not easy. Good job~! HI Would like to Aqalili, would like to ask , if going through their roundabout we have to turn right instead, right? If you want to get out from the roundabout, yup, turn right but make sure to take note there is traffic light at the roundabout.